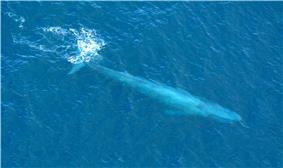 The blue whale (Balaenoptera musculus) is a largest extant animal and is the heaviest known to have existed. Blue whales are rorquals (family Balaenopteridae), a family that includes the humpback whale, the fin whale, Bryde's whale, the sei whale, and the minke whale. The family Balaenopteridae is believed to have diverged from the other families of the suborder Mysticeti as long ago as the middle Oligocene (28 Ma ago). It is not known when the members of those families diverged from each other. There have been at least 11 documented cases of blue-fin hybrid adults in the wild. Arnason and Gullberg describe the genetic distance between a blue and a fin as about the same as that between a human and a gorilla. Researchers working off Fiji believe they photographed a hybrid humpback-blue whale including the case of discovery through DNA analyzing from a meat sample found on Japanese market. The first published description of the blue whale comes from Robert Sibbald's Phalainologia Nova (1694). In September 1692, Sibbald found a blue whale that had stranded in the Firth of Forth—a male 24 m (78 ft)-long—which had "black, horny plates" and "two large apertures approaching a pyramid in shape". The specific name musculus is G. O. Sars adopted it as the Norwegian common name in 1874. 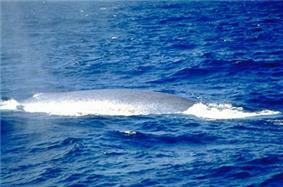 The blue whale has a long tapering body that appears stretched in comparison with the stockier build of other whales. The head is flat, U-shaped and has a prominent ridge running from the blowhole to the top of the upper lip. The front part of the mouth is thick with baleen plates; around 300 plates (each around one metre (3.2 ft) long) hang from the upper jaw, running 0.5 m (1.6 ft) back into the mouth. Between 70 and 118 grooves (called ventral pleats) run along the throat parallel to the body length. These pleats assist with evacuating water from the mouth after lunge feeding (see feeding below). The dorsal fin is small, ranging in height from 8–70 centimeters (3.1–27.6 in) (usually 20–40 centimeters (7.9–15.7 in)) and averaging about 28 centimetres (11 in). It is visible only briefly during the dive sequence. Located around three-quarters of the way along the length of the body, it varies in shape from one individual to another; some only have a barely perceptible lump, but others may have prominent and falcate (sickle-shaped) dorsals. When surfacing to breathe, the blue whale raises its shoulder and blowhole out of the water to a greater extent than other large whales, such as the fin or sei whales. Observers can use this trait to differentiate between species at sea. Some blue whales in the North Atlantic and North Pacific raise their tail fluke when diving. When breathing, the whale emits a spectacular vertical single-column spout up to 12 metres (39 ft), typically 9 metres (30 ft). Its lung capacity is 5,000 litres (1320 U.S. gallons). Blue whales have twin blowholes shielded by a large splashguard. The blue whale is the largest animal ever known to have lived. By comparison, one of the largest known dinosaurs of the Mesozoic Era was Argentinosaurus, which is estimated to have weighed up to 90 tonnes (99 short tons), comparable to the average of blue whale. Amphicoelias fragillimus, at an estimated 122.4 tonnes (134.9 short tons) is still lighter than the largest blue whales, despite being 190 feet (58 m) in length. Blue whales are difficult to weigh because of their size. As is the case with most large whales targeted by whalers, adult blue whales have never been weighed whole, but cut up into manageable pieces first. 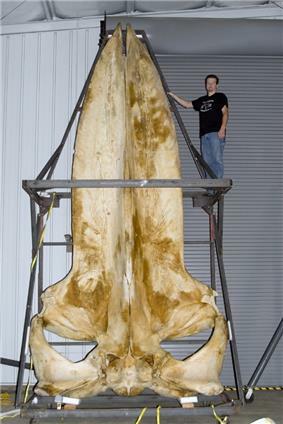 This caused an underestimate of the total weight of the whale, due to the loss of blood and other fluids. As a whole, blue whales from the Northern Atlantic and Pacific appear to be smaller on average than those from sub-Antarctic waters. Nevertheless, measurements between 150–170 tonnes (170–190 short tons) were recorded of animals up to 27 metres (89 ft) in length. The weight of an individual 30 metres (98 ft) long is believed by the American National Marine Mammal Laboratory (NMML) to be in excess of 180 tonnes (200 short tons). The largest blue whale accurately weighed by NMML scientists to date was a female that weighed 177 tonnes (195 short tons). There is some uncertainty about the biggest blue whale ever found, as most data came from blue whales killed in Antarctic waters during the first half of the twentieth century, which were collected by whalers not well-versed in standard zoological measurement techniques. The heaviest whale ever recorded weighed in at approximately 190 metric tons (210 short tons). The longest whales ever recorded were two females measuring 33.6 and 33.3 metres (110 and 109 ft), although in neither of these cases was the piecemeal weight gathered. The longest whale measured by scientists at the NMML was a 29.9 metres (98 ft), female caught in the Antarctic by Japanese whalers in 1946–47. Lieut. Quentin R. Walsh, USCG, while acting as whaling inspector of the factory ship Ulysses, verified the measurement of a 30 m (98 ft) pregnant blue whale caught in the Antarctic in the 1937–38 season. The longest reported in the North Pacific was a 27.1 metres (89 ft) female taken by Japanese whalers in 1959, and the longest reported in the North Atlantic was a 28.1 metres (92 ft) female caught in the Davis Strait. ^ Carpenter, K. (2006). "Biggest of the big: a critical re-evaluation of the mega-sauropod Amphicoelias fragillimus." In Foster, J.R. and Lucas, S.G., eds., 2006, Paleontology and Geology of the Upper Jurassic Morrison Formation. New Mexico Museum of Natural History and Science Bulletin 36: 131–138. ^ The use of Order Cetartiodactyla, instead of Cetacea with Suborders Odontoceti and Mysticeti, is favored by most evolutionary mammalogists working with molecular data  and is supported the IUCN Cetacean Specialist Group and by Taxonomy Committee  of the Society for Marine Mammalogy, the largest international association of marine mammal scientists in the world. See Cetartiodactyla and Marine mammal articles for further discussion. In New Zealand, whales have been seen in many areas close to shore, most notably around the Northland coast, in the Hauraki Gulf and the Bay of Plenty, off South Taranaki Bight, in Cook Strait and off Kaikoura with remarkably increasing sighting trends in recent years with some whales started staying in the same area near the shore for several days. Similar approaches with Portland's case to use helicopters was once attempted in South Taranaki Bight, but seemingly been cancelled according to considerations. The Tokyo National Museum in Ueno Park displays a life-sized model of a blue whale in the front. Several other institutions such as Tokai University and Taiji Whale Museum hold skeleton of skeleton model of Pygmy blue whales, while several churches and buildings in western Japan including Nagasaki Prefecture display jawbone of captured animals as a gate. The South African Museum in Cape Town, South Africa, features a considerable hall devoted to whales and natural history known as the Whale Well. The centrepiece of the exhibit is a suspended mounted Blue Whale skeleton, gleaned from the carcass of a partially mature specimen which washed ashore in the mid 1980s. The skeleton's jaw bones are mounted on the floor of Whale Well to permit visitors a direct contact with them, and to walk between them so as to appreciate the size of the animal. Other mounted skeletons include that of a Humpback Whale and a Right Whale, together with in-scale composite models of other whales, dolphins and porpoises. The North Carolina Museum of Natural Sciences in Raleigh, North Carolina features a mounted skeleton of a blue whale which visitors can view from both the first and second floors. The Melbourne Museum and Museum of New Zealand Te Papa Tongarewa both feature a skeleton of the pygmy blue whale. The Museum of Natural History in Gothenburg, Sweden contains the only stuffed blue whale in the world. There one can also find the skeleton of the whale mounted beside the whale. The Aquarium of the Pacific in Long Beach, California features a life-size model of a mother blue whale with her calf suspended from the ceiling of its main hall. The Beaty Biodiversity Museum at the University of British Columbia, Canada, houses a display of a blue whale skeleton (skull is cast replica) directly on the main campus boulevard. 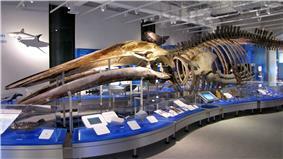 A real skeleton of a blue whale at the Canadian Museum of Nature in Ottawa was also unveiled in May 2010. The Natural History Museum in London contains a famous mounted skeleton and life-size model of a blue whale, which were both the first of their kind in the world, but have since been replicated at the University of California, Santa Cruz. Similarly, the American Museum of Natural History in New York City has a full-size model in its Milstein Family Hall of Ocean Life. A juvenile blue whale skeleton is installed at the New Bedford Whaling Museum in New Bedford, Massachusetts. 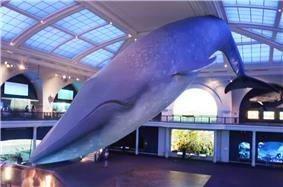 The Exhibition Lab's blue whale at the American Museum of Natural History. Blue whales may be wounded, sometimes fatally, after colliding with ocean vessels, as well as becoming trapped or entangled in fishing gear. The ever-increasing amount of ocean noise, including sonar, drowns out the vocalizations produced by whales, which makes it harder for them to communicate. 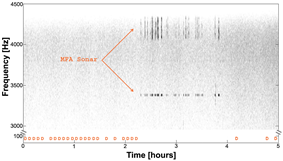 Blue whales stop producing foraging D calls once a mid-frequency sonar is activated, even though the sonar frequency range (1–8 kHz) far exceeds their sound production range (25–100 Hz). Human threats to the potential recovery of blue whale populations also include accumulation of polychlorinated biphenyl (PCB) chemicals within the whale's body. Due to their enormous size, power and speed, adult blue whales have virtually no natural predators. There is one documented case in National Geographic Magazine of a blue whale being attacked by orcas off the Baja California Peninsula; although the orcas were unable to kill the animal outright during their attack, the blue whale sustained serious wounds and probably died as a result of them shortly after the attack. Up to a quarter of the blue whales identified in Baja bear scars from orca attacks. Migratory patterns of these subspecies are not well known. For example, pygmy blue whales have been recorded in the northern Indian Ocean (Oman, Maldives and Sri Lanka), where they may form a distinct resident population. In addition, the population of blue whales occurring off Chile and Peru may also be a distinct subspecies. Some Antarctic blue whales approach the eastern South Atlantic coast in winter, and occasionally, their vocalizations are heard off Peru, Western Australia, and in the northern Indian Ocean. In Chile, the Cetacean Conservation Center, with support from the Chilean Navy, is undertaking extensive research and conservation work on a recently discovered feeding aggregation of the species off the coast of Chiloe Island in the Gulf of Corcovado(Chiloé National Park), where 326 blue whales were spotted in 2007. In this regions, it is normal for blue whales to enter Fiords. 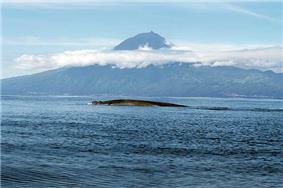 Whales also reach southern Los Lagos, such as off Caleta Zorra, live along with other rorquals. 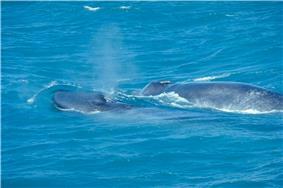 A fourth subspecies, B. m. indica, was identified by Blyth in 1859 in the northern Indian Ocean, but difficulties in identifying distinguishing features for this subspecies led to it being used as a synonym for B. m. brevicauda, the pygmy blue whale. Records for Soviet catches seem to indicate that the female adult size is closer to that of the Pygmy Blue than B. m. musculus, although the populations of B. m. indica and B. m. brevicauda appear to be discrete, and the breeding seasons differ by almost six months. Several congregating grounds are recently confirmed in Oceania, such as on Perth Canyon off Rottnest Island, waters of Great Australian Bight off Portland, and in South Taranaki Bight. Both species of Southern Blues and Pygmy Blues use waters off Western Australia, and coastal areas of eastern North Island of New Zealand, from Northland waters such as in the Bay of Islands and Hauraki Gulf in north to Bay of Plenty in the south as breeding and calving grounds by some females, and as migratory colliders (very close to shore in the NZ region). At least for whales off southern and Western Australia and some others are known to migrate into tropic coastal waters in Indonesia, Philippines, and off East Timor  (animals in Philippines may or may not originate from North Pacific populations as whales regularly appear off Bohol, north of the Equator). In the Southern Hemisphere, there appear to be two distinct subspecies, B. m. intermedia, the Antarctic blue whale, and the little-studied pygmy blue whale, B. m. brevicauda, found in Indian Ocean waters. The most recent surveys (midpoint 1998) provided an estimate of 2,280 blue whales in the Antarctic (of which fewer than 1% are likely to be pygmy blue whales). Estimates from a 1996 survey show that 424 pygmy blue whales were in a small area south of Madagascar alone, thus it is likely that numbers in the entire Indian Ocean are in the thousands. If this is true, the global numbers would be much higher than estimates predict. Of the populations that once existed off coastal Japan, the last recorded confirmed stranding was in the 1950s. Some scientists regard that historical populations off Japan were driven to extinction by whaling activities, mostly from the Kumanonada Sea off Wakayama, in Tosa Bay, and in the Sea of Hyūga. Nowadays, possible vagrants from either eastern or offshore populations are observed on very rare occasions off Kushiro. There were also small, but constant catch records around the Korean Peninsula and in the coastal waters of the Sea of Japan although this species is considered not to enter into marginal seas, such as the Sea of Okhotsk, on usual migrations. Whales were known to migrate further north to eastern Kamchatka, the Gulf of Anadyr and the Commander Islands. Only three sightings were made between 1994 and 2004 in Russia and whales have not been confirmed in Commander Islands for over past 80 years. Historically, wintering grounds existed off the Hawaiian Archipelago, Northern Mariana Islands, Bonin Islands and Ryukyu Islands, Philippines, Taiwan, Zhoushan Archipelago, and South China Sea coasts such as in Daya Bay, Leizhou Peninsula, and Hainan Island, and further south to Paracel Islands. Archaeological records suggest Blue whales once migrated into Sea of Japan coasts of Korean Peninsula and Japanese coasts, and to Yellow and Bohai Sea as well. During cetacean sighting visual surveys in Tsushima Strait conducted by Japanese Coast Guard, several gigantic whales measuring over 20m in length have been observed in recent years, however their exact identities are unclear. A stranding was recorded in Wanning in 2005. For further status in Chinese and Korean waters, see Wildlife of China. In the North Atlantic, two stocks of B. m. musculus are recognised. The first is found off Greenland, Newfoundland, Nova Scotia and the Gulf of Saint Lawrence. This group is estimated to total about 500. The second, more easterly group is spotted from the Azores in spring to Iceland in July and August; it is presumed the whales follow the Mid-Atlantic Ridge between the two volcanic islands. 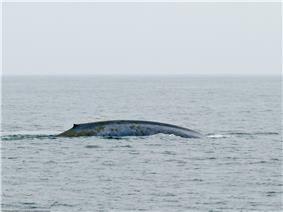 Beyond Iceland, blue whales have been spotted as far north as Spitsbergen and Jan Mayen, though such sightings are rare. Scientists do not know where these whales spend their winters. The total North Atlantic population is estimated to be between 600 and 1,500. Off Ireland, the first ever confirmed sightings were made in 2008, since then Porcupine Seabight has been regarded as a prominent habitat for the species along with fin whales. 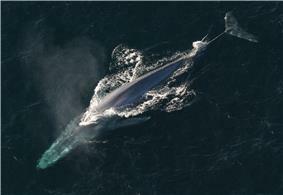 The IUCN Red List counts the blue whale as "endangered" as it has since the list's inception. In the United States, the National Marine Fisheries Service lists them as endangered under the Endangered Species Act. The largest known concentration, consisting of about 2,800 individuals, is the northeast Pacific population of the northern blue whale (B. m. musculus) subspecies that ranges from Alaska to Costa Rica, but is most commonly seen from California in summer. Infrequently, this population visits the northwest Pacific between Kamchatka and the northern tip of Japan. The total world population was estimated to be between 5,000 and 12,000 in 2002, although there are high levels of uncertainty in available estimates for many areas. Since the introduction of the whaling ban, studies have examined whether the conservation reliant global blue whale population is increasing or remaining stable. In the Antarctic, best estimates show an increase of 7.3% per year since the end of illegal Soviet whaling, but numbers remain at under 1% of their original levels. According to a 2014 study, the Californian Blue Whale population has rebounded to an estimated 97% of its pre-hunting population. Blue whale hunting was banned in 1966 by the International Whaling Commission, and illegal whaling by the Soviet Union finally halted in the 1970s, by which time 330,000 blue whales had been caught in the Antarctic, 33,000 in the rest of the Southern Hemisphere, 8,200 in the North Pacific, and 7,000 in the North Atlantic. The largest original population, in the Antarctic, had been reduced to 0.15% of their initial numbers. All of historical coastal Asian groups were driven into virtual extinctions in very short periods by Japanese industrial hunts. Those groups once migrated along western Japan to East China Sea were likely to be wiped out much earlier as the last catches on Amami Oshima was between 1910s and 1930s, and the last of known stranding records on Japanese archipelago excluding Ryukyu Islands were over a half - century ago. Commercial catches were continued until 1965 and whaling stations targeting blues were mainly placed along Hokkaido and Sanriku coasts. Blue whales are not easy to catch or kill. Their speed and power meant that they were rarely pursued by early whalers, who instead targeted sperm and right whales. In 1864, the Norwegian Svend Foyn equipped a steamboat with harpoons specifically designed for catching large whales. Although it was initially cumbersome and had a low success rate, Foyn perfected the harpoon gun, and soon several whaling stations were established on the coast of Finnmark in northern Norway. Because of disputes with the local fishermen, the last whaling station in Finnmark was closed down in 1904. 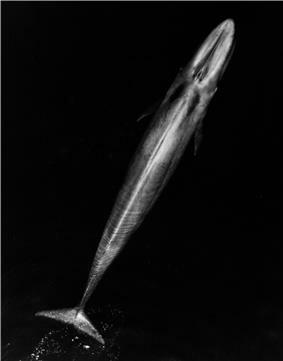 Estimates made by Cummings and Thompson (1971) suggest the source level of sounds made by blue whales are between 155 and 188 decibels when measured relative to a reference pressure of one micropascal at one metre. All blue whale groups make calls at a fundamental frequency between 10 and 40 Hz; the lowest frequency sound a human can typically perceive is 20 Hz. Blue whale calls last between ten and thirty seconds. Blue whales off the coast of Sri Lanka have been repeatedly recorded making "songs" of four notes, lasting about two minutes each, reminiscent of the well-known humpback whale songs. As this phenomenon has not been seen in any other populations, researchers believe it may be unique to the B. m. brevicauda (pygmy) subspecies. Blue whale strandings are extremely uncommon, and, because of the species' social structure, mass strandings are unheard of. When strandings do occur, they can become the focus of public interest. 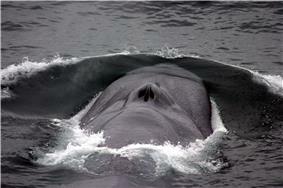 In 1920, a blue whale washed up near Bragar on the Isle of Lewis in the Outer Hebrides of Scotland. It had been shot by whalers, but the harpoon had failed to explode. As with other mammals, the fundamental instinct of the whale was to try to carry on breathing at all costs, even though this meant beaching to prevent itself from drowning. Two of the whale's bones were erected just off a main road on Lewis and remain a tourist attraction. Scientists estimate that blue whales can live for at least 80 years, but since individual records do not date back into the whaling era, this will not be known with certainty for many years. The longest recorded study of a single individual is 34 years, in the eastern North Pacific. The whales' only natural predator is the orca. Studies report that as many as 25% of mature blue whales have scars resulting from orca attacks. The mortality rate of such attacks is unknown. Mating starts in late autumn and continues to the end of winter. Little is known about mating behaviour or breeding grounds. Females typically give birth once every two to three years at the start of the winter after a gestation period of 10 to 12 months. The calf weighs about 2.5 tonnes (2.8 short tons) and is around 7 metres (23 ft) in length. Blue whale calves drink 380–570 litres (100–150 U.S. gallons) of milk a day. Blue whale milk has an energy content of about 18,300 kJ/kg (4,370 kcal/kg). The calf is weaned after six months, by which time it has doubled in length. Sexual maturity is typically reached at five to ten years of age. In the Northern Hemisphere, whaling records show that males averaged 20–21 m (66–69 ft) and females 21–23 m (69–75 ft) at sexual maturity, while in the Southern Hemisphere it was 22.6 and 24 m (74 and 79 ft), respectively. In the Northern Hemisphere, as adults, males averaged 24 m (79 ft) and females 25 m (82 ft), while in the Southern Hemisphere males averaged 25 m (82 ft) and females 26.5 m (87 ft). In the eastern North Pacific, photogrammetric studies have shown sexually mature (but not necessarily fully grown) blue whales today average 21.6 m (71 ft), with a maximum of over 24.4 m (80 ft) – although a 26.5 m (87 ft) female stranded near Pescadero, California in 1979. An adult blue whale can eat up to 40 million krill in a day. The whales always feed in the areas with the highest concentration of krill, sometimes eating up to 3,600 kilograms (7,900 lb) of krill in a single day. 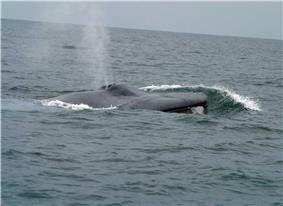 The daily energy requirement of an adult blue whale is in the region of 1.5 million kilocalories. Their feeding habits are seasonal. Blue whales gorge on krill in the rich waters of the Antarctic before migrating to their breeding grounds in the warmer, less-rich waters nearer the equator. The blue whale can take in up to 90 times as much energy as it expends, allowing it to build up considerable energy reserves. Blue whales feed almost exclusively on krill, though they also take small numbers of copepods. The species of this zooplankton eaten by blue whales varies from ocean to ocean. In the North Atlantic, Meganyctiphanes norvegica, Thysanoessa raschii, Thysanoessa inermis and Thysanoessa longicaudata are the usual food; in the North Pacific, Euphausia pacifica, Thysanoessa inermis, Thysanoessa longipes, Thysanoessa spinifera, Nyctiphanes symplex and Nematoscelis megalops; and in the Southern Hemisphere, Euphausia superba, Euphausia crystallorophias, Euphausia valentini, and Nyctiphanes australis.